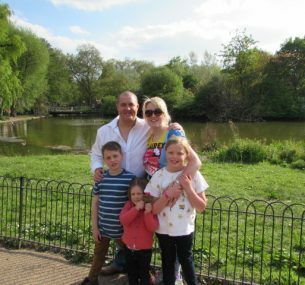 Claire ran the 2017 London Marathon to raise funds for Children with Cancer UK. Claire’s son Louis was just 19 months old when he was diagnosed with acute lymphoblastic leukaemia (ALL). Claire tells us why she ran the London Marathon. 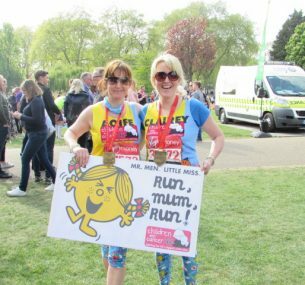 Why did you run the London Marathon 2017 for Children with Cancer UK? My family got involved with Children with Cancer UK in 2010 after our son Louis was diagnosed with leukaemia. My husband has run three times, several other family members and close friends have well and truly done their bit, so I thought it was time I did mine. How did you feel at the start of the London Marathon course? I felt really excited at the start line with a few butterflies, a bit like my wedding day! How was the first 14 miles of the race? I really enjoyed the first 14 miles as I ran them with my cousin John, who also ran for Children with Cancer UK. He made me laugh and entertained me, so the time passed quicker. All I kept in my mind the whole way round was what Louis had been through over a three year period. However much my body hurt and ached, it could not compare to what he had been through. I had his name printed on the back of my vest too so he was with me all the way. Did you see your family and friends throughout the course? I saw lots of friends and family along the way and had support every few miles. This made such a difference and kept my spirits up, especially past 20 miles when it got really tough. I found it really emotional every time I saw someone I knew. How much have you raised so far for Children with Cancer UK? To date the three of us – Aoife, John and myself have raised £12,224 for Children with Cancer UK. Do you plan to do anymore fundraising events for Children with Cancer UK? Over the past six years friends and family have done lots for Children with Cancer UK. I am so proud to have done the marathon, but don’t think I will do it again. I will always continue to support the charity though. Have you got anything you would like to share with us? Have you got a message to anyone planning to run the marathon next year? Everyone talks about having a ‘Reason To Run’, I think you need to have a strong reason to run to keep you motivated. The training is tough and it takes commitment and organisation to build the training into your life. Training for the marathon and running on the day is the toughest challenge I have ever set myself. I cannot describe the feeling when you run through the finish line and have your medal put over your head; I was a teary mess by this point. The other thing you must have is a belief in yourself that you can do it. There were times when I doubted myself and I had a mantra for those moments “She believed she could so she did”. It got me through anyway! Toughest part: At 20 miles when I thought too much about how everything hurt. I saw my cousins shouting for me here which was perfect timing. Best part: You cannot describe the support and kindness you receive from strangers all the way round and how entertaining it is. There were jazz bands, choirs, steel bands, bag pipes and so much more. All of this helps you along the way and makes the time pass quicker. Know someone who might be interested in fundraising?